Happy Friday! 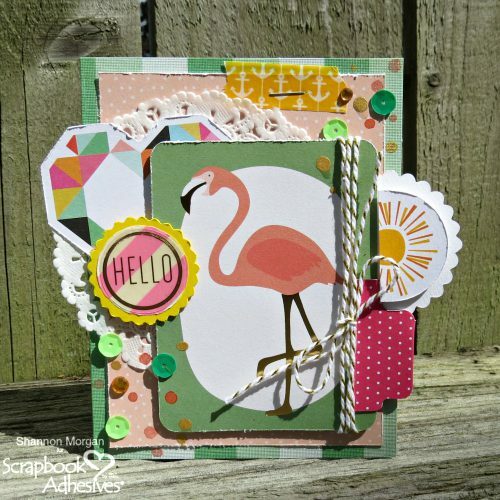 It’s Shannon sharing a card with you today featuring a summery feel using Scrapbook Adhesives by 3L® products! 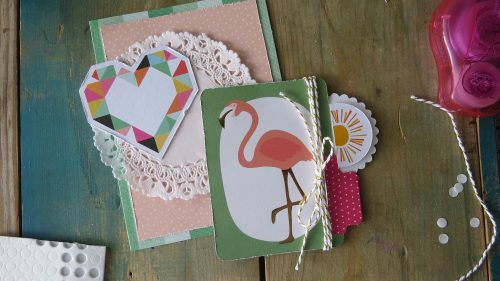 This card is easy to pull together, you can gather summery, bright colored scraps and embellishments. Tip: If you’re looking for a time saver on visual punch, look through your stash at your 3X4 journaling cards (I know everyone has a ton of those like I do!). Scrapbook Adhesives by 3L has so many different adhesives available for you to use your projects. Pictured above is E-Z Runner® Permanent Fine Adhesive Dispenser. This adhesive is so awesome for anything vellum or sheer. You have the hold of a quality adhesive without the lines! 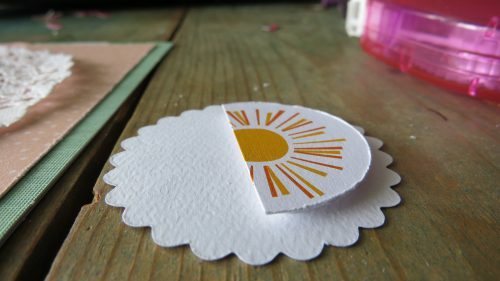 I wanted this sun to stand out just a bit, so I used the 3D Foam Circles White Mix for dimension. It works perfectly for this shape with the right amount of pop for this card. Mat the pink rectangle layer to the card base to form the foundation with the E-Z Runner® Permanent Strips Refillable Dispenser. Its simple background for all the fun layers that will be added. 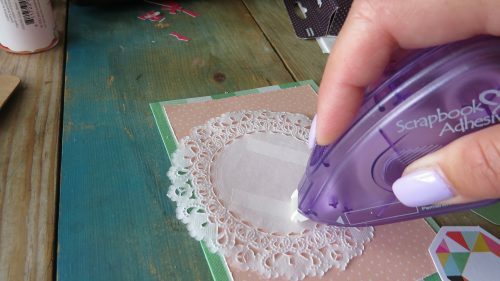 Next, add a doily and a mosaic heart die cut slightly off center on top of the doily. 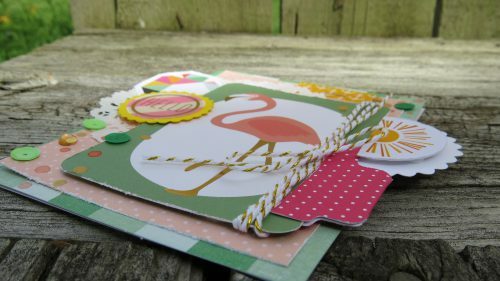 My centerpiece is the fun flamingo journal card which I wrapped twine around several times. Lastly, I added the sun embellishment with a cute polka dot tab. Tip: Use Adhesive Dots Mini to keep that twine bow in place. If you add a dot behind the bow, it will keep secured nice and neat. These awesome adhesive dots can be used for sequins, and other small embellishments you may want to add to your card. Thanks for letting me share with you today! I hope I have inspired you to create something summery with layers! This entry was posted in 3D Foam Circles, Adhesive Dots & Lines, Adhesives, Beginner, Cards, Crafts & Tutorials, E-Z Runner® Dispensers, Embellishments, Permanent Adhesive, Seasonal Craft Ideas, Skill Level, Summer, Tutorial and tagged 3D Foam Circles White Mix, Adhesive Dots Micro, Card, Card Making, E-Z Runner Grand Dispenser, E-Z Runner Grand Permanent Strips Refill, E-Z Runner Permanent Fine, E-Z Runner Permanent Strips, E-Z Runner Permanent Strips Refill, E-Z Runner Permanent Strips Refillable, E-Z Runner Permanent Strips Refillable Value Pack, Shannon Morgan, Vellum. Bookmark the permalink.